I’m thinking of a number between one and ten. Which number? Concentrate real hard. Try to become one with my thoughts. Perhaps if we close our eyes at the same time and synchronize our breathing, I can transmit the answer to you. Are you able to receive my thoughts? Are you in tune? If not, maybe try a little harder. Maybe if our fingertips touched. Have you guessed the number? The number is seven. Great job! We are psychically connected. Or, maybe you knew the answer because I told it to you. Maybe it wasn’t your undiscovered sixth, seventh or eighth sense that gave you the clue. Maybe it was only one of your five normal senses. Maybe you were paying attention. Maybe the answer was in front of you all the time. Am I denying the existence of extra senses that link us? Not necessarily. I’m just saying that the five senses that definitely DO link us do a pretty good job. So, before we employ extrasensory perception, try sensory perception. 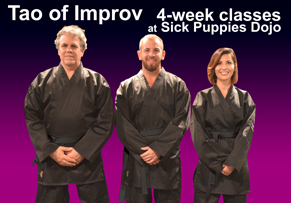 Want to achieve the state that some improvisers call Group Mind? It’s easy. Listen to your scene partner(s). Watch what’s going on. Make eye contact. Be open to body language, vocal intonation, facial expression; in other words, pay attention to the human qualities of the human beings you’re performing with. If you are present, if you are perceiving what is happening around you, and if everyone else is doing the same thing, voila! Group Mind! It’s not mystical. Yes, I know that’s a downer for those who need to see everything as mystical. It’s also good news for those who want to be able to do good improv without having to grow antennae or develop new senses. Just use the ones you already have more efficiently. Group Mind happens. It is a result of knowing what you’re doing, being aware, and being open. I once worked with a director who asked us to be more aware of the subconscious things we were doing during scenes. No one had the nerve to mention that, by definition, if you are aware of something you’re thinking, it’s not subconscious. I’ll repeat: It is IMPOSSIBLE to be aware of your subconscious. That’s why it’s called “subconscious.” It’s slightly pathological to try. Let the subconscious do what it does. You can’t control it, though you may be able to program it over time. As for everything else…just be conscious. Let the pathological give way to the merely logical.